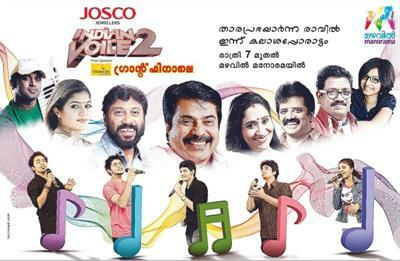 Josco Indian Voice Season 2 Grand Finale 2013 live streaming will be done on those websites which stream telecast on Mazhavil Manorama live. The grand finale will be held on 24th August 2013 at 7.00 P.M. With Abhijith T Ajith, Athira Murali, Aslam Abdul Majeed, Jeevan P Kumar and Jithin Raj being the 5 finalists, the winner of Josco Indian Voice Season 2 winner will be announced by Megastar Mammotty. The wait for enjoy the grand finale of Josco Indian Voice Season 2 Grand Finale 2013. The grand finale will be held on 24th August 2013 at 7.00 P.M. With Abhijith T Ajith, Athira Murali, Aslam Abdul Majeed, Jeevan P Kumar and Jithin Raj being the 5 finalists, the winner of Josco Indian Voice Season 2 winner will be announced by Megastar Mammotty. Invited celebrities including Siddique and other will be attending the function. With Sharath, Sreenivas and Sujatha donning judges in Josco Indian Voice Season 2, the programme is going to be a real competition between the best singers in Kerala. After the grand success of Josco Indian Voice Season 1, Mazhavil Manorama has taken initiative to continue the wonderful music reality show with young singers selected from different parts of the state. As the show has attracted millions of people around the world it has viewers enjoying the real spirit of music. Music lovers from USA, UK, Ireland, Kuwait, UAE, Mumbai, and Chennai have taken high interest to watch the show. It would be one of the greatest music reality show ever telecast in the history in malayalam television channels. Other than the sweet melodies sung by the participants, the show will be blessed with the music, dance and other programmes performed by gifted artists representing the industry. Leaving no space to predictions, Abhijith T Ajith, Athira Murali, Aslam Abdul Majeed, Jeevan P Kumar and Jithin Raj, the 5 finalists will fight for the title Shakthisree Gopalan, Sujatha and other well talented singers would lend their voice for selected songs which would keep the viewers intact. So don't miss to catch the real essence of music offered by the talented singers from Josco Indian Voice Season 2 Grand Finale 2013.